Lock up all your merchandise or leave some available for shopping - it's up to you. 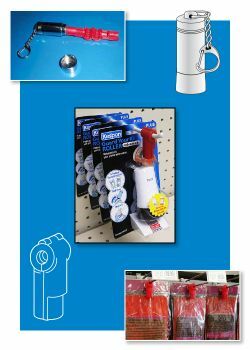 Peg hook product display materials are widely used merchandisers at retail stores of all sizes and kinds. Securing the display hook's contents from theft while maintaining easy customer access has been a challenge. Clip Strip Corp.'s Anti Theft Peg Hook Locks with Magnetic Key provides the right blend of security and product visibility. You no longer have to sit back and let your Products disappear from the store or ALWAYS have to keep an eye out every moment, on your more expensive "peg hooked" items. Let Clip Strip Corp., innovators in the POP industry, help you Generate Sales and Protect your Merchandise with the most Affordable & Effective theft-deterrent available today for display hooks! And it pays for itself on the first save it makes, becoming a money maker, not a cost. It's easy to use, when your customer wants a product, it's as easy as 1, 2, 3 for your staff to remove the peg hook lock security device. 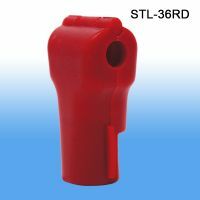 Minimum quantity for "Anti-Theft Peg Hook-Lock™, STL-36" is 25. Used to Open our Peg Hook-Lock theft deterent. Minimum quantity for "Magnetic Key for Anti-theft Peg Hook-Lock™, MKL-46" is 1.